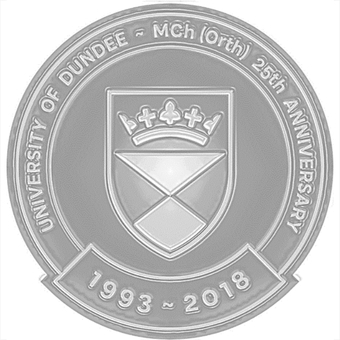 A Dinner & Ceilidh was held to celebrate the 25th Anniversary of the MCh (Orth) degree on Saturday 2 June 2018 in the ballroom of the Invercarse Hotel, Dundee. There was definitely a celebratory feel about the entire evening with almost 80 students, staff, faculty and invited guests enjoying a three-course meal, an address by Professor Rami Abboud (MCh Orth Course Director), followed by award presentations for the year and a Ceilidh dance. Each attendee received a specially designed and struck nickel-silver pin badge as a memento of the occasion. Professor Abboud and three faculty members from the early years of the course, Mr John Dent, Mr Amar Jain and Mr Bill Hadden opened the evening by cutting a specially made cake of the occasion. Professor Abboud then presented the course awards to the winning students. Left: Professor Abboud giving his speech; Centre: Mr Hadden, Mr Dent, Professor Abboud and Mr Jain cuttung the cake; Right: Mr Jariwala addressing the room. Professor Abboud presented Mr Amar Jain with a framed print of Dundee as a gift of appreciation and to mark his retirement from Honorary Clinical Senior Lecturer/Consultant Orthopaedic Surgeon earlier this year. He then presented Sheila MacDonald (Course Administrator) and his wife, Dorin Zaiyaie, with bouquets of flowers for their constant support over the years. Professor Abboud then presented Ian Christie with a 25-year-old limited edition single grain whisky on the occasion of his 50th birthday. Left: Professor Abboud presenting Schweta Jariwala with the 25-year-old whisy; Right: Mr Jain receiving gifts to mark his retirement. A bottle of 25-year-old malt whisky was also raffled on the night and was won by Schweta Jariwala who is in fact teetotal but has promised to invite any whisky drinkers around for dinner at her and her husband, Mr Arpit Jariwala’s home. Mr Jariwala also gave a humorous speech on his experiences of the course, which went down exceptionally well. Everyone then thoroughly enjoyed a few hours of Scottish Country Dancing before celebrations came to a close. Left: MCh (Orth) candidates chatting with Dr Weijie Wang (Senior Lecturer) and Mr Stephen Parsons (External Examiner); Right: Let's eat! “I can’t believe a quarter of a century has passed since the conception of the MCh (Orth) course by my friend and mentor, David Rowley. It was so nice to see so many friendly and influential faces from the past and present, without whom this course would not and could not have grown into the huge success it currently is. We should all be proud of what we have achieved together. I’d personally like to congratulate the 2017-2018 candidates on successfully completing the criteria for the awarding of the degree. I hope it’s a pleasant surprise for you to be forever known as our ‘quarter-century batch’! Remember, your MCh (Orth) journey doesn’t end when you leave the TORT Centre for the last time. You, like hundreds of graduates before you, are our valued Alumni and we’re always here to support and take an interest in your future careers. It is with enormous pride that I can call you our Ambassadors. Enjoying the Ceilidh ... oversease students must think us Scots are a strange old bunch. The MCh (Orth) course was instigated and lead by Professor David Rowley in 1993. David Rowley was an inspirational scholar who worked tirelessly to promote orthopaedics all over the world and his drive ensured the course got off to an excellent beginning. It was Professor Rowley who passed the reigns of Course Director on to Professor Abboud swiftly in 1996 and who went on to change its structure to its current attractive and innovative curriculum.